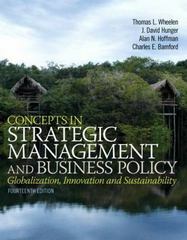 Concepts in Strategic Management and Business Policy 14 Edition For Strategic Management and Business Policy courses. Class-tested approach to Strategy with new focus on environmental sustainability. Wheelen and Hunger’s class-tested approach to teaching Strategy is brought into sharper focus with a new theme: environmental sustainability. By bringing the sustainability theme into focus, this text equips students with the strategic concepts they will need to know as they face issues such as climate change, global warming and energy availability. MyManagementLabfor Strategic Management and Business Policy is a total learning package. MyManagementLab is an online homework, tutorial, and assessment program that truly engages students in learning. It helps students better prepare for class, quizzes, and exams–resulting in better performance in the course–and provides educators a dynamic set of tools for gauging individual and class progress. This program will provide a better teaching and learning experience–for you and your students. Here’s how: Improve Results with MyManagementLab: MyManagementLab delivers proven results in helping students succeed and provides engaging experiences that personalize learning. Environmental Sustainability Theme Focused: Present students with critical topics such as climate change, global warming, and energy availability. Help Students Apply Concepts to Real-Life Scenarios: A Strategic Management Model provides structure for content and case analysis. Note: You are purchasing a standalone product; MyManagementLab does not come packaged with this content. If you would like to purchase both the physical text and MyManagementLab search for ISBN-10: 0133254186/ISBN-13: 9780133254181. That package includes ISBN-10: 0133126145/ISBN-13: 9780133126143 and ISBN-10: 0133123685/ISBN-13: 9780133123685. MyManagementLab is not a self-paced technology and should only be purchased when required by an instructor.